Find My Workspace lists over 95% of the business centres market in Perth (Scotland). Simply click Request Quote to check pricing for one office, or Add to Basket for multiple offices. 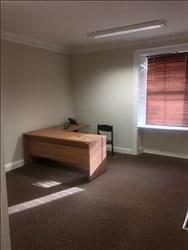 This building has offices for rent available immediately and on flexible terms. The offices range in size from 110 square feet to 200 square feet. Tenants can also take advantage of additional storage space within each office. The centre offers a convenient inclusive rate, with dedicated internet connection, heating and electricity bills all lumped into one payment. The space is of an excellent standard and in Perth City Centre’s Museum District. Tenants will benefit from shared kitchen and WC facilities. The property has an intercom entry system. Large windows ensure the work space is filled with natural light, making for a productive atmosphere. Located immediately adjacent to St Catherines Retail Park, this office space has been extensively refurbished, creating an attractive business environment. The office accommodation is on the first and second levels, with secure access available from both the front and rear of the building. The suites benefit from high levels of natural daylight, and open plan configurations. This centre provides a full range of facilities, such as a fitted kitchen in which you can arrange beverages to keep you motivated throughout the day. In addition, the offices are carpeted for quiet movement, ensuring focus. This centre provides attractive upper floor office suites which are ideal for small and growing businesses. A range of accommodation is available in a refurbished, ready-to-move-in condition on attractive flexible leasing terms, starting from 1 month. The offices have access from both the front and rear of the property, and benefit from stair-lift access. To obtain information for your selected Perth & Kinross Business Centres, please tick the "Add to basket" box for each office you prefer and complete the form below. We will then send a detailed report via email.